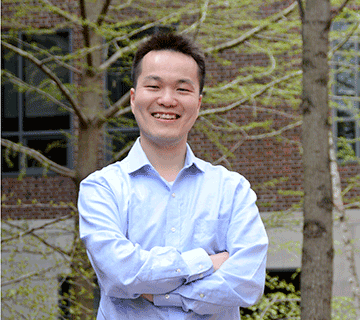 Jiang He, a graduate student from the Zhuang Research Lab, has been chosen as the graduate student winner of Harvard’s 2016 Commencement Student Orations Competition. Jiang’s speech will discuss the unequal distribution of knowledge throughout the world, and what can be done to improve the dissemination of knowledge, based on his own experiences growing up in the rural Hunan Province in Southern China. Without access to modern medicine, Jiang’s mother could only rely on this extreme folk remedy. This, and many other similar incidents from his childhood, were the inspiration for his speech. The three winning speeches will be delivered from memory during the Morning Exercises of Commencement on May 26th. Traditionally, one speech is given by a graduate student, and two by undergraduates, one of which will be in Latin. The first round of competition involves judges combing through hundreds of potential speeches, submitted electronically by students. The choices are narrowed down to about a dozen in each of the three categories for the first round of auditions, then down to about a dozen total for the final round. “We don’t have to memorize the speech at the auditions. The judges will allow us to read the draft to them, and they will judge which one has a good message and fits the spirit of commencement day,” Jiang said. After graduation, Jiang will begin his postdoc through MIT at the Koch Institute for Cancer Research. For now, Jiang is looking forward to commencement as a chance to share his experiences with his peers.